We tested 8 campaign ads from 4 key election contests with more than 500 voters using technology to capture their moment-by-moment reactions. The ads were all about positions on the jobs and the economy, and the results were surprising. Part Two of a series, read Part One here. As we noted last week, we used The Reactor, a technology that allows us to tap into voters’ emotional responses to understand exactly how voters feel when they see these ads and hear these messages. This week’s test was conducted with over 500 Democrats, Independents and Republicans from around the country to get voters’ second-to-second, gut reactions. Last week’s ads focused on attitudes toward government. The results clearly showed that many of the anti-government messages from the Republicans (and Tea Party candidates) were working with Democrats and Independents as well. On jobs and the economy, the picture looks different–and surprisingly so. We see some Democrats scoring well with positive economic messages about balanced budgets and green jobs. We also saw Democrats focus their attacks on outsourcing and even NAFTA, to mixed success. Overall, in these races, the Democrats’ messages do better expected given the economic environment, while ads from their Republican opponents had a tougher time hitting the mark. 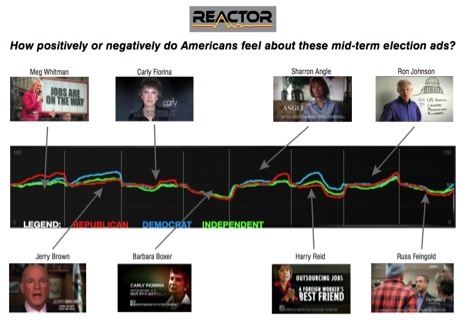 Our conclusions are below, but we invite you to judge yourself–take a look at the second-by-second reactions of voters (separated by Democrat, Republican and Independent) as they watched 8 campaign ads. “I am not a politician, I am an accountant and a manufacturer.” Not exactly the most romantic or eloquent political statement, but it was the most effective line in the eight ads we tested. In fact, it was the only line that worked across party lines. Johnson manages to thread the needle–emphasizing his outsider status without tainting himself as connected to big business (note that he doesn’t call himself a businessman at all). Unfortunately for Johnson, the ad takes way too long to pay off the line, so its power is somewhat limited. “End the bailouts.” It is unclear why any Republican in this election cycle would ignore this phrase. At worst it has limited impact with Independents and Republicans. At best it energizes the right and brings much of the rest of the country along with it. Nevada Republican Senate candidate Sharron Angle used it in this week’s ad. Overall her this ad was much less effective with Dems and Independents than the ad we tested last week, but it still popped with Republicans. “He’s powering a new clean energy industry.” On the other side of the Nevada race stands Democrat Senate Majority Leader Harry Reid. He starts his ad by hammering home detailed facts about green jobs he has created, generating strong positives from Democrats, and mild positives from Independents Republicans. The use of specific numbers on job creation has a strong impact in this ad. Though the ad then shifts to attack Angle, the positive message about green jobs was a relative winner, even though we haven’t heard much about the green revolution during this election cycle. “Independence” vs. “Accountability.” We tested ads from the California gubernatorial race that pitted Democrat Jerry Brown against Republican Meg Whitman. Brown’s ad noted that, “at this stage in his life, he has the independence to make the tough decisions.” Whitman, on the other hand, said that Sacramento could benefit from the “accountability and focus” of a business. Ironically, Brown is the positioning himself as a fiscal conservative, while Whitman tries to put power in the hands of the people. Though both ads played well within their parties, Brown’s emphasis on specifics, especially “no taxes without voter approval,” played better than Whitman’s fairly trite “mission” to create jobs, cut waste and improve schools. Advantage: Brown. The reaction to each of these ads was negative (as is typically the case for negative ads). What is telling is the intensity of response. If we had to pick a winner, it would be Senator Barbara Boxer’s attack on Carly Fiorina. This attack, full of lots of support points that directly relate to Fiorina’s tenure at HP, generated the greatest negative intensity. Though this ad isn’t going to persuade anyone to vote for Boxer, it is powerful enough to support a negative narrative about Fiorina and have an impact on the race. Black-and-white and Boring. Speaking of attack ads, the rule should definitely be “go big or go home.” We know that negative ads almost always generate negative reactions across the board. We also know the ones that end up working are the ones that generate the high intensity responses. The worst thing a candidate can do is launch an attack that simply doesn’t generate a reaction from the voters. Unfortunately, that’s exactly what Carly Fiorina did in her attack on Barbara Boxer in California. This hyperdramatic black-and-white ad actually had very little punch. It sought to blame Barbara Boxer for “trillions in reckless, wasteful spending” and “crushing hopes.” It failed to connect these results with any votes or actions Boxer has taken. The disconnect between effect and cause led to one painful result: boredom and minimal impact from Republicans, Democrats and Independents alike. This research is part of an ongoing collaboration between maslansky luntz + partners and Roy Morgan Research to monitor Americans’ reactions to a range of political ads during the run-up to the Mid Term Elections. The Reactor is Roy Morgan Research’s proprietary online research tool designed to continuously measure respondents’ reactions to these ads. More to come…We expect the next update to be out next week. If you would like to see the results of these and similar research studies, just sign up on our site.